More than half the year is gone. YIKES! School will be starting soon and the beautifully lazy-ish days of summer will be replaced by the constant ferrying of the child to and from school, lessons, activities, etc. I say lazy-ish since the schedule changes constantly during the summer. For now, we are trying to relish these last couple of weeks before the normalcy of the school year routine sets in. I've taken a few weeks off from menu planning which has been great from the stand point of being flexible with whatever's growing in the garden, using up stuff from the freezer, and going out with friends. However, it has not been so great when I've gotten the I've-been-canning-all-day-and-don't-have-a-clue-what's-for-supper-let's-just-get-take-outs. My waistline and wallet have been affected most by that lack of planning. I hope you've had a good summer. Pumpkin risotto sounds interesting! Which recipe do you use? 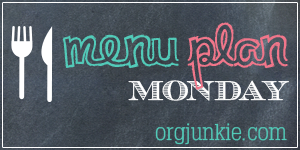 I think I'll start doing a menu plan post again.